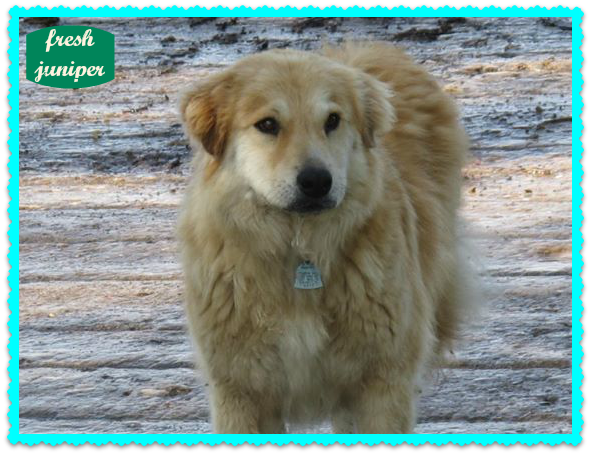 fresh juniper: Summer Safety Warning to Dog Owners - Guest Post by Dr. Susan Williamson, D.V.M. Summer Safety Warning to Dog Owners - Guest Post by Dr. Susan Williamson, D.V.M. I am so excited to introduce a new guest blogger, Dr. Susan Williamson, D.V.M. Dr. Williamson is a relief veterinarian on the east coast. She is the mother of four lively little boys, enjoys quilting and baking, and raises Swedish Flower Hens. Her debut post here addresses a very important issue for dog owners everywhere. Please read and share her message. Help us save doggie lives! Last week’s heat wave got me thinking about this topic. It is not an easy one. Some people are offended when I talk about this one. But I have also learned many, many people simply don’t think or know about it, so it’s important to risk offending people to educate others. And to perhaps save just one life. The topic that I have actually had people yell at me over is leaving their pet in the car “for just five minutes.” This is never a good idea. At just 70 degrees, your car can become an oven within just a few minutes. In just a few minutes, if your car is parked in the sun, the interior temperature can rise 10-25 degrees. Multiple studies, which you can read at mydogiscool.com, show that even leaving the window “cracked” is not going to prevent this extreme rise in heat. Last week, while it was hot, I myself parked my car in my driveway. I run the AC to the point my kids say they are cold and leap from the car into the heat with abandon when we stop, but within 15 minutes after parking and shutting the car off, the interior was up over 100 degrees. After our next errand, I left all four windows down about halfway (way more than most people leave the windows down when they leave a dog in the car) and the temperature was still over 100 degrees when we got back in later that day. 100 degrees doesn’t sound all that bad...but keep reading. Just a few minutes in the store might turn into more than that due to circumstances beyond your control. How many times have you gone into a store and the line is long? Or there is just one person doing check out? Or something goes wrong with the checkout system? Or they need a price check on the guy in front of you? Yeah. It usually happens, thanks to Mr. Murphy, when you are in a hurry. Even leaving the car running isn’t a great idea. A few years ago, a police dog died in a police car when the AC in the car failed while the office was in a building. Your car might be stolen if you leave it unattended while running (it would here!) or you might get a ticket (it is illegal in many areas to leave a running car unattended). So what temperature is too much, what happens, and what should you do? Dogs can only cool themselves via panting. They do not sweat well, except on the pads of their feet. Their normal body temperature is warmer than ours, with an average of 101. 103 is the high end of normal. So when they get warm, which is about 102-103 degrees body temperature, they begin to pant. But if the air around them is warm, just 85-90 degrees (which it will be inside a car within minutes), heat exchange with the environment is less effective than it could be, especially in closed confines of a car or if they can’t get out of the sun. Heat begins to build up in their system. Add in humidity, and it speeds up the heat build up. They begin to show signs of heat distress at about 103-104 degrees body temperature: lethargy or restlessness, excessive panting, very thick saliva, and/or red mucous membranes. As it progresses and their body temperature continues to rise, they may begin to vomit or have diarrhea , develop seizures (IME, once you see this, many pets die), become unsteady, slip into a coma, and even suffer rapid death. This process may even be faster for a brachycephalic breed, such as a Pug, bulldog, boxer, etc. They really do not exchange air and heat well because of their anatomy already, and being in a hot and humid environment sure does not help them. Dogs with medical issues, are older or are puppies are also at a higher risk of heat injury. In just a few minutes at 85 degrees, especially if it is humid, your dog’s body temperature can go over 104 degrees, at which point it would be fair to say he probably has heat exhaustion. At 106 degrees body temperature, brain damage starts to occur. At 109 degrees body temperature, various processes begin, the worst being something us veterinarians, in our morbid sense of humor, call “Death Is Coming.” The actual medical term is disseminated intravascular coagulation (DIC). What this means, in a very simplified form, is the clotting process is activated, despite there not being an actual need for it, and microclots are formed in blood vessels all over the body. This has consequences of its own as the clots damage organs, but the real downside is the clotting factors are all used up very rapidly during the activation process, and then the normal clotting process, which goes on all the time at a normal rate, does not happen. They begin to bleed internally, and they die from internal bleeding they cannot stop on their own without prompt treatment at a veterinary clinic with blood products available. DIC is often fatal even with treatment. At 109 degrees, most pets will die. I have never seen one survive 110 degrees body temperature. Other consequences could be heart failure, fluid build up in the lungs, sudden kidney failure, liver failure, and brain damage, usually all secondary to DIC. These may not be reversible, and if your pet survives, she will live with the results for the rest of her life. If you see a pet left in the car, call the police. Call 911. In many states, this is considered an emergency, and it may even be illegal in your state to leave a pet unattended in a car. I cannot recommend breaking a window, as you might be charged, but I know some people who have, saved the pet in distress and paid the ticket they got after the police arrived (and also cited the pet owner). I have had customer service use the intercom to tell the owner of the vehicle the police are on the way to rescue the pet. When the temperatures are not in the dangerous level, I carry education cards I leave on windows of cars I see with dogs in them; one day, I left SIX cards on cars with dogs in them (but it was only 50 degrees that day... but I imagine those cars were stuffy from the humidity the dog exhaled when he was breathing). I have said something to people when I see them leaving a pet in the car, and some have yelled at me. Others said they didn’t know. Keep a few flyers with you for education. The website MyDogIsCool.com has some you can order and keep with you. If you were out playing with your pet and he seems to be having heat-related problems, take his temperature if you can, and find a hose, wet towels or other sources of cool water; ice is not recommended as it constricts blood vessels, keeping heat inside. Cool him by running water on his pads, head, ears, chest and abdomen. If the dog or cat can drink, let them, but do not force feed water. Run a fan if possible, and get him into the AC as quickly as possible. Your goal is to drop his temperature to 103-104 degrees and then stop. Excessive cooling can be just as dangerous as a too hot temperature at this time. Call your veterinarian, or a veterinarian, as soon as possible. This is important: even if your dog seems normal, take him in anyway. I usually run a quick ECG and a blood panel to rule out cardiac damage and organ damage, preferably as soon as possible and then repeat it a few days later to catch damage that may have been slow to appear, on dogs that the owner treated for heat exhaustion. Your veterinarian likely has a protocol she follows as well. Unfortunately, this often means bring your credit cards. None of this will be cheap. Veterinary care isn’t free. Veterinary hospitals are small businesses, just like the plumber or the mechanic. Pet health insurance does not work like your HMO or PPO insurance plan. You are going to have to pay for all of this. Many vets will work with you and might not even charge you for everything, but please don’t expect it to be for free, even if your pet dies. We will incur expenses while doing what we can for your pet, usually pulling staff off of other patients to help stabilize your pet and using equipment and medication that then can’t be used on another patient. We have to purchase the needed blood products, which do not come cheaply from the Red Cross, and supplies. Veterinarians love animals and care about their owners, but love does not make sure a hospital is well equipped for the next patient. If your pet is seizuring, passing bloody stools, vomiting blood, or in a coma, the situation is dire. Work on cooling the dog down while transporting to the nearest emergency clinic; call ahead if you can so they can be ready and meet you at the door. Many small animal hospitals will not have the equipment, medications (such as blood products) and staff available to support your pet, which will need 24 hour care for the next several days while he fights for his life. The most common reason behind the death of children in hot cars is someone forgot; a person not used to doing the daycare run or pickup actually forgets the child is in the car. There is a very good article from the Washington Post on how and why this happens that you can look up, and I will not rehash it here. But this is not generally true for pets left in the car. One common theme is, “The dog wanted to go on a car ride, because he likes it, and I had to run to the store.” Another common phrase heard is, “I picked the dog up from the groomer/daycare/vet and had some errands to run on the way home, and I didn’t think it would be a big deal. While I have met a few people who have forgotten their dog was in the car, it is not nearly as common a theme as that associated with children. When it does happen, it usually is someone has picked up the pet from the vet/groomer, the dog is asleep in the back of the car, they are busy with children and the mail and stuff, and they forget. Try keeping your pet’s leash on the front seat, put a stuffed animal on the seat or dash when the dog is in the car, or put a bell on the pet’s collar (although this would assume your pet moves when you stop the car and you hear it jingle) as a reminder to get the pet out too. The emotional fallout for the owner is tremendous. They made a bad choice for their pet, and now the pet is ill or dead, and they have a huge medical bill to pay. A lot of “what-if” and “if-only” is heard in the consultation room, along with many tears and self-recrimination. While your dog might like going in the car, don’t take him unless you know you can take him into the store with you. I was delighted today when we walked through Home Depot and a woman had her dog with her. I have stopped people in the parking lot of Tractor Supply and insisted they take their dog in, which is store policy. I have held pets for owners as they check out at our hospital so they don’t feel like they need to put the pet in the car first. But a post office, X-mart run and that ilk might not be as pet-friendly, and your pet should stay home, no matter how much they like the car or as convenient as it might be for you. Run your errands before picking your pet up from the vet or groomer, or go back out after bringing the pet home. If the weather is hot, forego that play session outside and play inside. Make sure your pet has access to shade, cool clean water and a cool area to rest during the heat of the day. A dog house can actually be too hot if it is in the sun. While these prevention tips might take a few more minutes, it really does take just a few minutes to save a pet’s life. While I don't own a dog, I'll be more aware when I'm out and about to watch for dogs left in cars. Prior to reading this, I would have been very reluctant to call 911... Thanks for the info. This is such an important post and can't be said often enough. 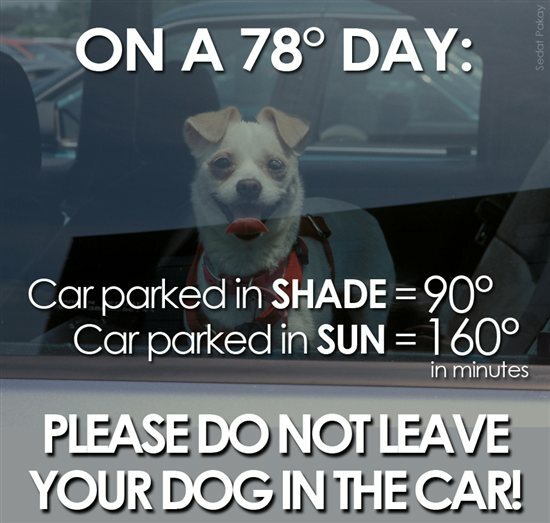 Even if you're just going into the store for "a second" DO NOT LEAVE YOUR DOG IN THE CAR! Thanks for spreading the word!